This in from the TACNY list. 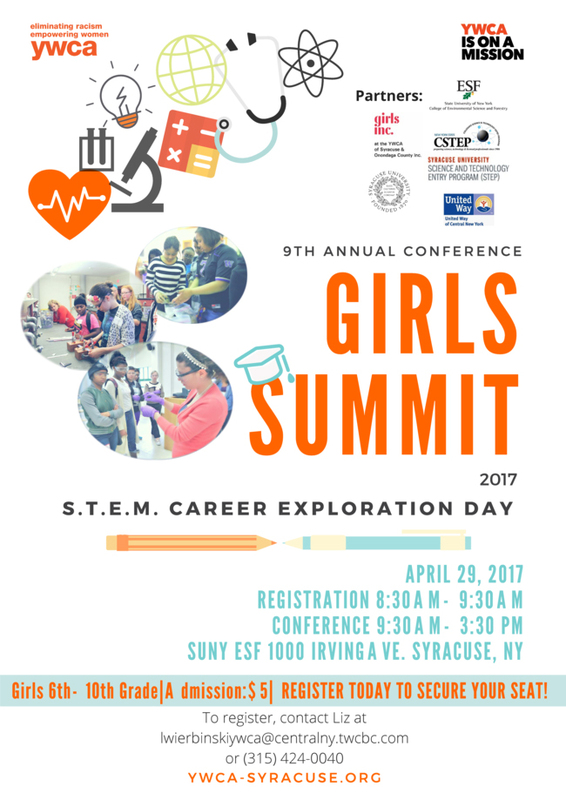 One week to go before the 2017 Girls Summit, held on the SUNY ESF campus this Saturday. Please forward this along to anyone you think might be interested! Girls Summit is a career exploration day for girls in grades 6-10 on Saturday April 29th, 2017 at the College of Environmental Science and Forestry (ESF) from 8:30 AM – 3:30 PM. The event’s GPS address is 1000 Irving Ave. Girls Summit is organized by Girls Inc. at the YWCA in collaboration with ESF, Syracuse University, Syracuse University’s STEP (Science, Technology Entry Program), and New York State CSTEP (Collegiate Science & Technology Entry Program). Participants will attend hands-on workshops about a variety of STEM topics throughout the day and a panel discussion about the high school-to-college transition will close the day. This event aims to (1) spark the spirit, trigger the imagination and encourage young women to consider new and exciting career opportunities; (2) increase a girl’s interest in math, science and technology and in persistence with school; (3) provide girls with opportunities to meet and form personal contacts with women working in non- traditional fields; and (4) provide hands-on learning about alternative careers in a format that is committed to benefiting girls of all ethnicities, races, religions, abilities, and backgrounds. 3:15 – 3:30: Closing Ceremony & Door Prizes! PLEASE NOTE: Your registration will not be considered complete until a registration fee of $5.00 is made to the YWCA by cash, credit, check, or money order. Call our main office at (315) 424-0040 to make a payment by credit card. Please make checks out to “YWCA Syracuse & Onondaga County” and drop off in person or by mail to 401 Douglas St. Syracuse, NY 13203. If mailing in a payment, please include contact information for the participant. Payment may be made on the day of the event, however it is strongly encouraged to pre-pay via the above options. If you have any questions please contact Liz Wierbinski at lwierbinskiywca@centralny.twcbc.com or by phone at 315-424-0040. For aircraft to fly, they require propulsive force (thrust). Engines contribute a majority of this force. But how do they produce thrust and how does thrust contribute to flight? Charles will explain the scientific principles that make thrust possible and introduce one of the latest advancements in gas turbine engine technology that is making flights quieter, greener and more efficient. He will also speak about his experiences as a student in a STEM field, and briefly on the Link Trainer, which recently found a new home at the MOST! Charles Mayaka works as a Design Engineer for Rotors in the Compression Systems Module Center department under the Advanced Engines Program at Pratt & Whitney in Middletown, Connecticut. Briefly before joining Pratt & Whitney, Charles worked as an Aerodynamics Engineer at Belcan Corporation in Windsor, Connecticut. Charles was born in Kisii, a little town in Kenya. Always curious about aviation, he was admitted to one of only two schools in the entire country that offered Aviation Technology as a technical elective. Through the guidance of his AT instructor (Mr. Owiti), his desire to pursue a career in aviation was further cemented. Upon high school graduation, Charles came to the United States and was later enrolled in the College of Engineering and Computer Science at Syracuse University where he obtained both his Bachelor of Science degree in Aerospace Engineering and his Master of Science degree in Mechanical and Aerospace Engineering last year. At Syracuse University, Charles worked as an Experimental Researcher under Prof. Thong Dang building intricate aircraft wing sections for use in wind tunnel experiments. Charles also served as the President of the SU chapter of the American Institute of Aeronautics and Astronautics & Sigma Gamma Tau. He was involved in the National Society of Black Engineers and supported NSBE Jr’s tutoring engagement and tutoring program at Nottingham High School, Design Build Fly (DBF) and the Society of Hispanic Professional Engineers (SHPE). Other at-large community involvement while at Syracuse University included volunteering as a tutor at The Dunbar Center in the South Side and at The Samaritan Center right in Downtown Syracuse. 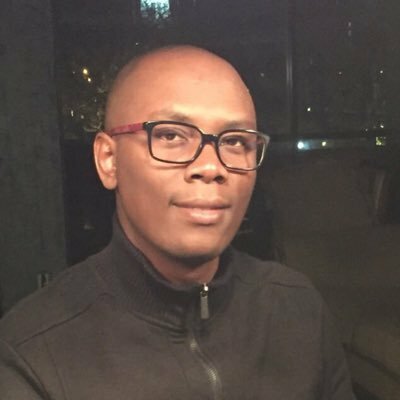 In his spare time, Charles likes golf, building RC Aircraft and flying them, running (like every Kenyan), soccer, tennis, chess, & cooking Kenyan dishes. This in from the TACNY listserve – note the March 3rd deadline. SU’s College of Engineering and Computer Science encourages current high school juniors from CNY to apply for our Summer Research Internship Program. This is an exciting opportunity for students interested in STEM fields! The College of Engineering and Computer Science, with funding from alumni Thomas and Linda McCausland, have created engineering research opportunities for five talented rising high school seniorswho reside locally. This six-week non-residential program is an opportunity for students to work directly with SU research professors, graduate and undergraduate students on a discrete hands-on research project as part of ongoing research specific to each faculty mentor. Detailed information regarding the internship, applicant eligibility and requirements including the on-line application can be found on our new website: highschooleng.research.syr.edu. Completed applications must be submitted by 5:00 PM Friday, March 3, 2017. For more information, please feel free to contact Carol Stokes-Cawley, Program Coordinator Summer Research Internship Program, at cestokes@syr.edu.